Neither Hilary nor Nick grew up on a farm. Nick Moore arrived to Almonte, ON in 2005 from High Wycombe, England, to attend a 9 month course at Rosewood Studio of Fine Woodworking. Little did he know that he would meet his future wife – an organic farmer – and move to Canada permanently, buy a farm and become a farmer, himself! Aside from his work on the farm, Nick’s reputation for reparing, restoring and building furniture is keeping him busy in the shop. To gain a sense of what his work is like, please visit nickmoore.ca. After becoming interested in food politics and the concept of Community Supported Agriculture in university, Hilary found herself in Amagansett, NY, apprenticing on one of the first CSA farms in North America. That was in 1999. Hilary returned home to work on the implementation of school yard vegetable gardens in inner city Ottawa, but missed the “rush” and beauty of farming. So, she did another farm apprenticeship in Lincoln, Massachusetts, where she learned how to drive horses, as well as organic animal husbandry of sheep, goats, pigs, milk cows and vegetables. Hilary has been farming full time ever since. She operated Teamwork CSA for 13 years, from 2001-2015. She is as convinced as ever that Community Supported Agriculture is a powerful way for us all to improve the health of our farmland and environment at large, our communities and our personal health. Hilary started out borrowing land, eventually settling in at Dunbrae Farms in Almonte, ON, where she operated her CSA for 7 years before her and Nick bought their own farm in Lanark, ON. 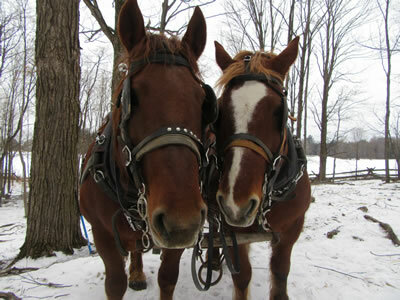 Today, Nick and Hilary grow vegetables for the Almonte Farmers’ Market, raise Tamworth and Birkshire pigs, laying hens, keep bees and their two Suffolk Punch workhorses, Winnie and Zeus. The farm is ever-evolving. Over the years, Hilary has been involved in many projects to help facilitate a healthier food system in the area. She was involved in the formation of the Ottawa Food Security Council (renamed Just Food) and remained as the Chair for its first year. She was also involved in the design of the Ottawa Good Food Box local food procurement initiative as well as a Schoolground Greening Initiative in Ottawa. She is an active member of the National Farmers Union and is the President of the Almonte Farmers’ Market. Our organic produce and honey are available at the Almonte Farmers Market. If you are looking for a quality meal out on the town, we also sell our produce and pickles to the Heirloom Café in Almonte. Our organic eggs are available for sale at our farm, as well as at Dunbrae Farms in Almonte.